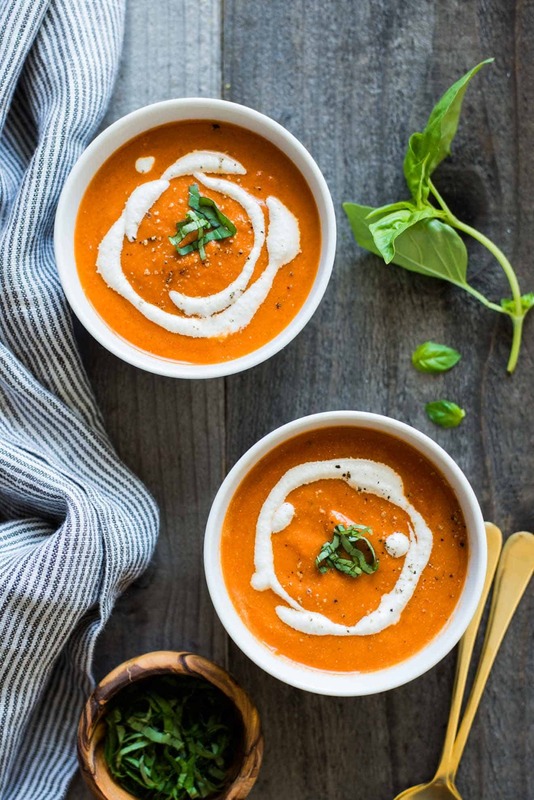 This simple vegan tomato soup gets its creaminess from light coconut milk. The soup is ready in just 30 minutes! I’m so not ready for it to be Monday already, yet here we are on tax day—my favorite day of the year. I suppose I can’t complain too much because I don’t handle my taxes. Contrary to popular belief, I’m not that great with numbers, and I’m worse at managing my finances. I’m just glad that I can shove those responsibilities to someone else. I only deal with food. Let’s move on to things that are slightly more in my wheelhouse. I’ve been having serious cravings for tomato soup lately, and the only way I know how to deal with them is to make it myself. This recipe is lightly adapted from a tomato soup recipe I found on Chowhound. I made quite a number of modifications here, but the most significant one would be swapping heavy cream for light coconut milk. I had my doubts about whether the coconut milk would work, but you don’t actually taste it at all! If you don’t have coconut milk lying around, soy milk or almond milk will work, too. 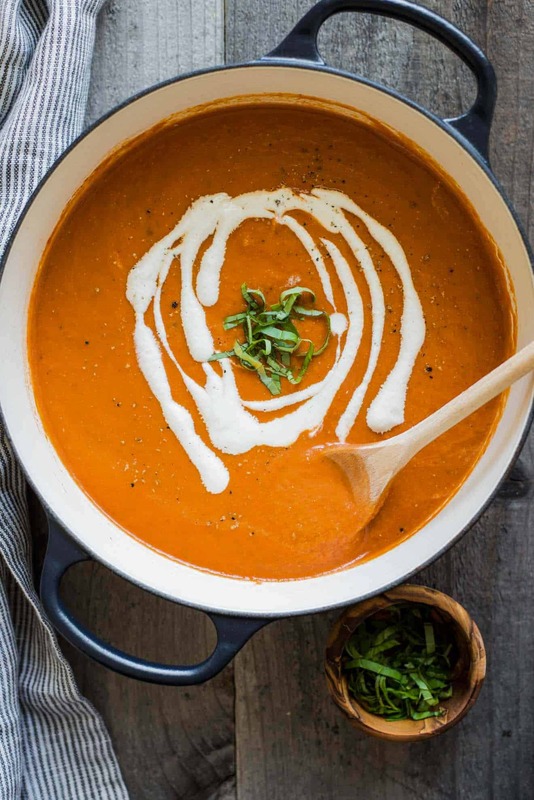 Only 30 minutes stand between you and delicious and creamy vegan tomato soup. It’s tangy, creamy, and perfect as an appetizer or a meal on its own with some croutons. Be careful with the tomatoes: In the directions, I ask that you break up the tomatoes with the back of a wooden spoon. Be careful, though! The tomatoes are incredibly squirty (<—probably not a real adjective, but you get the picture). Try to use a blender to mix the soup: Normally, I would use an immersion blender to blend soups right in the pot, but in this case, I highly recommend using a blender. The tomatoes squirt everywhere, and you’ll just create a huge mess if you use an immersion blender. Cashew Cream: If you want to make cashew cream for topping the soup, soak 1/2 cup of cashews with boiling water for about an hour. Reserve 1/2 cup of the liquid, and drain the rest. Blend cashews with the water until smooth. You can also a bigger batch of cashew cream. Just remember you want a 1:1 cashew cream to water ration. By the way, is it just me, or does the cashew cream drizzle on this soup look a bit like Bob Marley? 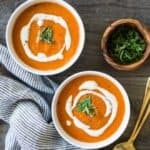 This easy vegan tomato soup is the perfect appetizer. It’s ready in 30 minutes! Lightly adapted from Chowhound. Heat olive oil in a heavy-bottomed pot, over medium-low heat. When the pot is hot, add onions and cook for 6 to 8 minutes, until the onions are soft. 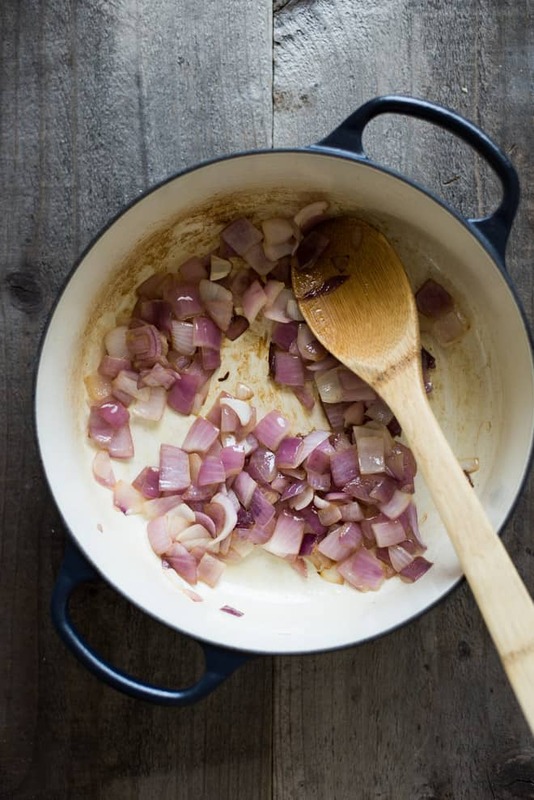 Stir often to keep the onions from burning. Add the entire can of whole tomatoes, including the liquid, and 1 cup of water. 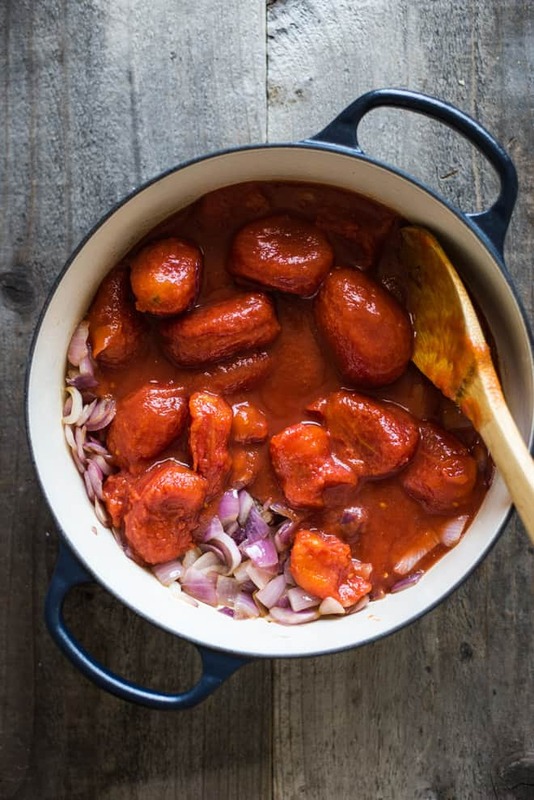 Using the back of a wooden spoon, gently smash the tomatoes. Add dried oregano, dried basil, paprika, and a pinch of kosher salt. Raise the heat to medium and bring everything to boil. Let soup simmer for 8 to 10 minutes. Turn off heat. Let the soup cool off for 5 minutes before transferring to a blender to blend. Return soup to pot and stir in coconut milk. Serve in bowls with black pepper, basil leaves, and cashew cream, if you like. To Make Cashew Cream: If you want to make cashew cream for topping the soup, soak 1/2 cup of cashews with boiling water for about an hour. Reserve 1/2 cup of the liquid, and drain the rest. Blend cashews with the water until smooth. 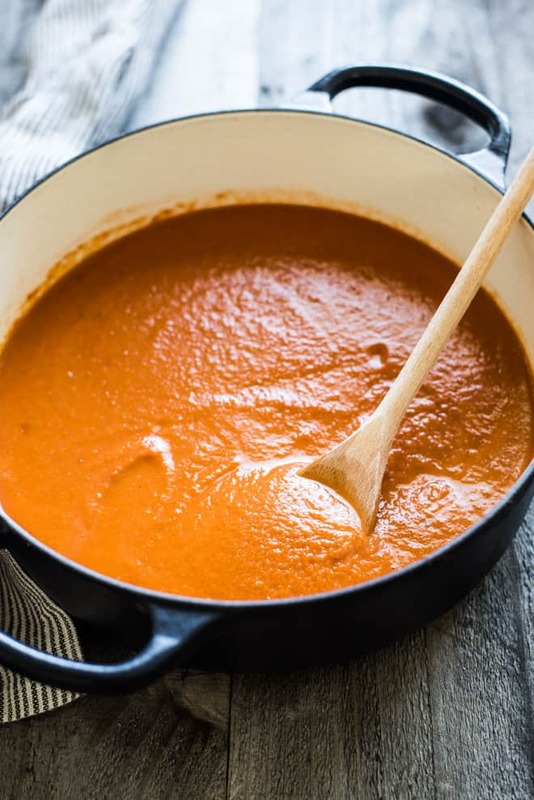 Tomato soup is the only pureed soup I enjoy–but I don’t just enjoy it, I LOVE it. It’s so creamy and comforting. Pinned! Thanks, Erin! Tomato soup is the best! How many calories would be in one serving? Oh man, a grilled cheese would have gone so well with the soup! This soup looks amazing! I love the photos 🙂 and that cashew cream makes for the perfect topping! Haha, I totally see Bob Marley. Too perfect! I have to try this soup asap – I am feeling hungry just by looking at the beautiful pics! Great blog! Thank you so much, Judith! Let me know how it goes! Can we use almond milk instead? Absolutely, Crystal! Thanks for your question! I made this last night and wanted to let you know that it was delicious! 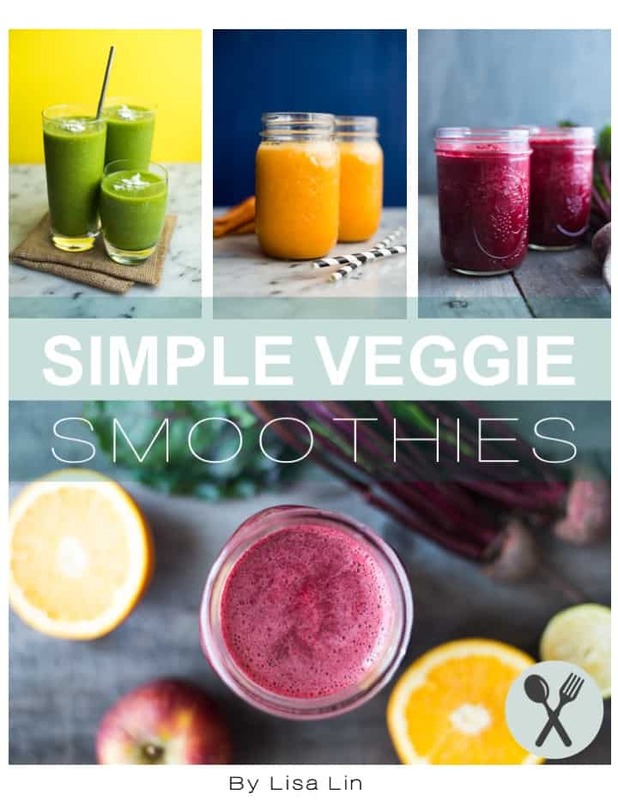 I made a few modifications, based on my preferences – I added garlic, roasted red pepper, tomato paste, used vegetable stock instead of water and omitted any milk. Actually quite a few modifications, but I used your recipe to guide me through the steps. And it was even better than I expected, super tasty, warm, comforting, a little tangy! I will probably make this again, and I am curious to try the cashew cream, it looks really good. Thanks for sharing! Sandra, thank you so much for trying my recipe and for taking the time to leave me a comment! I’m so glad you enjoyed it, and I love the idea of adding roasted red peppers. This is a great recipe. Blows Campbell’s out of the water and is super easy. I used almond milk in place of water for extra creaminess and full fat coconut milk. Also I had diced canned rather than whole tomatoes and that worked just fine. Hi Juliet! 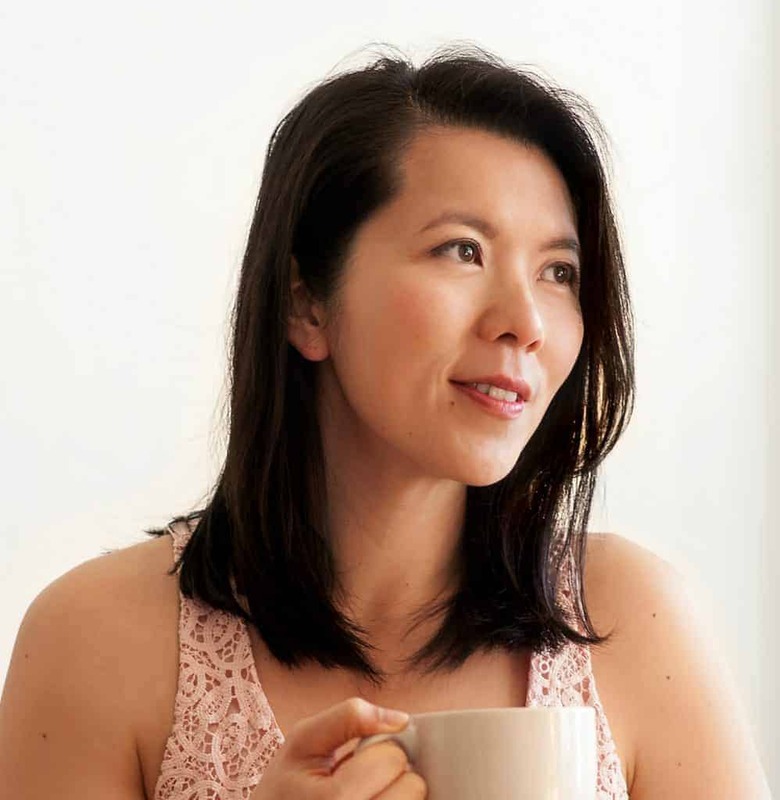 I am now @hellolisalin on Instagram. Thanks for making the recipe! Made this tonight with Vegan Grilled Cheese sandwiches…it was delish!!!! I had one bowl and my husband finished off the rest of the pot. Definitely a hit in this house!! This is such a great recipe. It’s so simple and quick to put together, but also delicious and comforting. I’ve made it twice this week (with vegan gf grilled cheese) and will make it many more times this winter, I’m sure! For the record, I used leeks instead of onions and pureed it with my immersion blender. It was a bit splattery, but less so when I doubled the recipe (which everyone should do anyway since it’s so yummy). Rachel, thanks for making this! I’m so glad you enjoyed it!! Thanks for trying it, Elizabeth! So glad you enjoyed it!